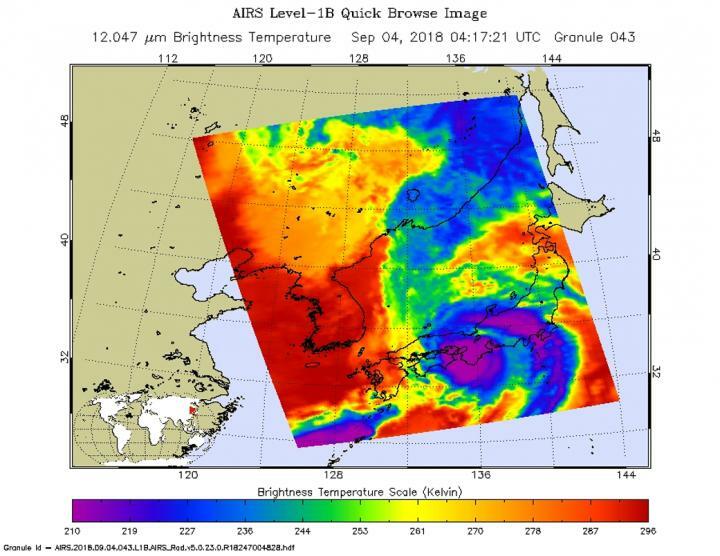 When NASA's Aqua satellite passed over Tropical Storm Jebi on Sept. 4 at 12:17 a.m. EDT (417 UTC) it had made landfall in southeastern Japan. The Atmospheric Infrared Sounder or AIRS instrument analyzed the storm in infrared light which provides temperature information. Temperature is important when trying to understand how strong storms can be. The higher the cloud tops, the colder and the stronger they are. Jebi's center crossed near Kyoto before it emerged into the Sea of Japan where it is getting caught up in the mid-latitude westerly jet stream. Jebi is in the process of becoming extra-tropical over the Sea of Japan as its wind field expands. Jebi should finish transition by Sept 5.